20 January 2017, at 6:00a.m. ITALY - At 722,900 tonnes, the volume of fresh/frozen pork imported into Italy during the first nine months of 2016 was 5 per cent behind year earlier levels, according to the latest figures released by Istat. Nonetheless, this still leaves Italy the second largest pork importer during Q1-Q3 2016 and therefore still an important player in the global pig meat marketplace. The key importing nations of Germany and the Netherlands saw shipments decline 1 per cent on year earlier levels, while Denmark and France saw relatively larger declines of 17 per cent and 23 per cent respectively. 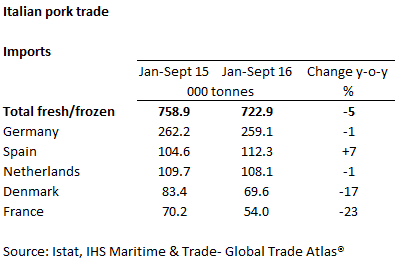 In contrast, shipments from second-largest importer Spain increased 7 per cent, reaching 112,300 tonnes. Import value was down in line with volume when considering the Q1-Q3 period as a whole, at €1.3 billion. However, this masks changes to average unit prices during the period. While unit prices were below year earlier levels during H1 2016, rising EU pig prices elevated these prices during Q3. Hence, while shipment volume was still down over 1 per cent on the year during the third quarter, the value of these imports was actually 10 per cent higher than a year earlier. Live imports showed strong year-on-year growth during the first three quarters of 2016, climbing 26 per cent to reach 1.2 million head during the period. Denmark and the Netherlands supplied most of these pigs, the majority of which were weaners. However Spain also nearly doubled the numbers shipped relative to the same period in 2015. Though Italian pork export volumes are considerably lower than imports, shipments grew 43 per cent on the year to the end of September 2016, reaching 74.6 thousand tonnes. Japan was the primary destination for this pork, though volumes declined on the year during Q3. Increasing shipments to Hong Kong contributed to the overall growth, though Hungary and Romania became increasingly important as the year progressed. Exports of Italian hams also increased over the same time period, up 18 per cent on the year to 21.2 thousand tonnes. Healthy growth from Spain, the dominant destination, alongside France and Germany, drove this increase. Look out for a further update on the Italian trade position in the weekly in early spring.